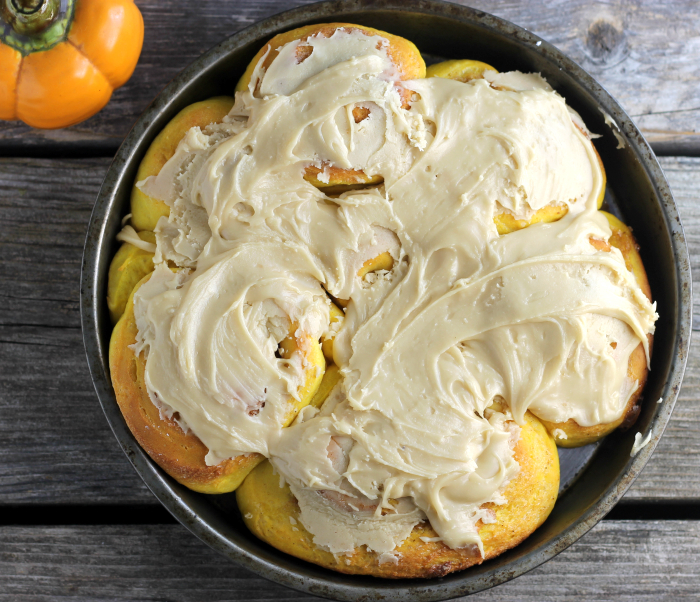 Pumpkin sweet rolls slathered with caramel frosting, its fall, and these sweet rolls are a perfect way to start your morning. 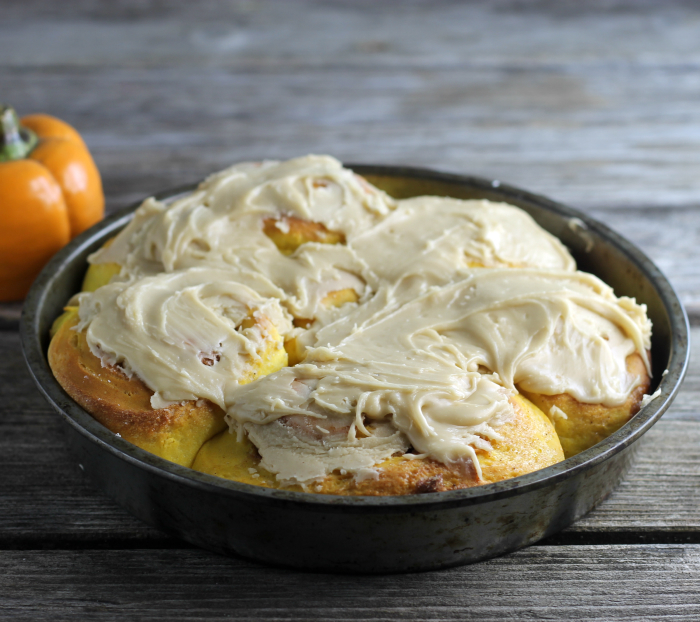 I took samples of these pumpkin sweet rolls to mom’s house last night so that my sister and mom could taste them. I like to use my mom and sister as judges on some of the things that I make for this blog. They are two great cooks and I know that if they like the samples then the recipes are blog worthy. I had some pumpkin in the refrigerator that was left over from another recipe that I made. The recipe did not turn out at all as I expected, but that is another story. So I had this pumpkin left in the refrigerator and I was trying to decide what to do with it. So pumpkin sweet rolls came to mind and I went with it. Sweet rolls are a tradition in my family and we have been making them forever. I remember when I was a kid and my Great Auntie Francis came for a visit. She made these wonderful orange rolls… as a matter of fact; I still make the orange rolls. They’re Mike’s favorite. That is also another story. So back to these pumpkin sweet rolls. 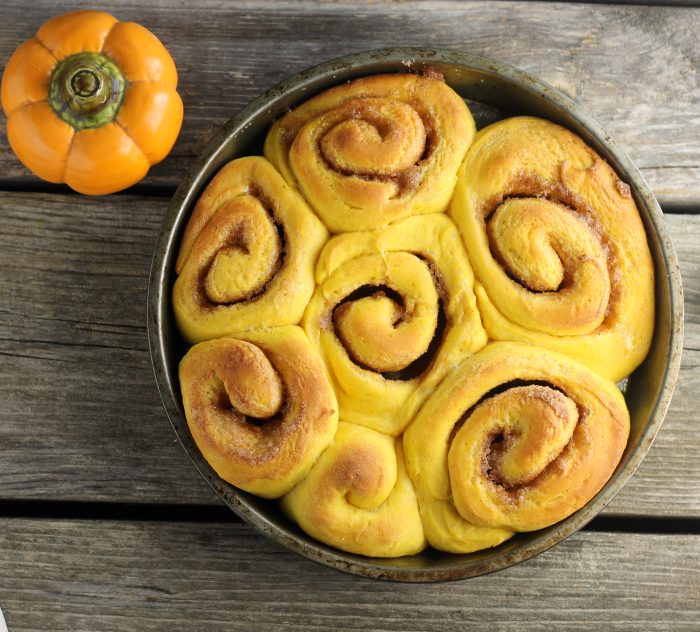 Pumpkin puree is added to the dough of the sweet rolls. The filling is made with sugar, cinnamon, ginger, nutmeg, and cloves. I love these spices in fall baking goods. The sweet rolls are soft and taste wonderful with the fall spices. These rolls are then slathered in a caramel frosting. These really should be on your breakfast table for Thanksgiving. Don’t you think? 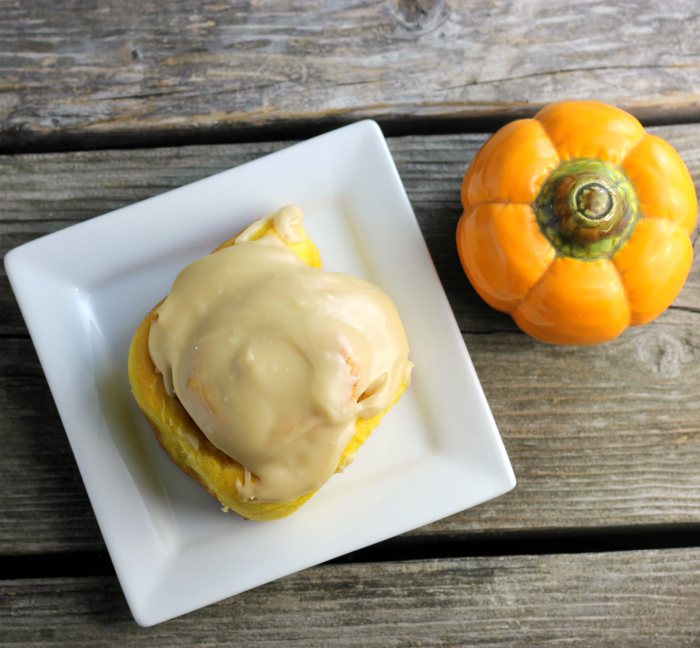 If you like pumpkin you may like this recipe. In a large bowl add 2 cups flour, yeast, 1/2 cup sugar, and salt; mix well. Heat milk to warm (120 to 130 degrees F) add the butter. Add the milk and butter to the flour mixture and stir in. Add the eggs and mix in. Gradually add the flour until you have a soft dough that is slightly sticky to the touch. Mix the flour into the dough by hand. Continue to knead dough until you have a dough that is smooth and slightly sticky. Cover and let rise for about an hour or double in size. Filling- while the dough is rising mix together the 3/4 cup sugar, cinnamon, ginger, nutmeg, and cloves and set aside. Once the dough is doubled in size, divide the dough into two equal parts. Pat the dough out into a 14 by 11-inch rectangle. Spread half of the softened butter over the dough. Sprinkle the half of the sugar and spices over the dough. Roll up the dough starting with the shorter side. Pinch edge to seal. Using scissors cut into 12 rolls. Place the rolls on a greased baking pan. Two 9 by 13-inch pan works well for the 24 rolls. Repeat with the second part of dough. Bake in a preheated 375 degrees F oven for 15 to 17 minutes. Remove from oven and cool. To a medium saucepan add the brown sugar, cream, and butter. Over medium heat bring to a boil; stirring constantly. Boil for a minute and remove from heat. Cool for a minute or two and add the powdered sugar to make the right consistency to spread. Beat frosting with a wooden spoon until smooth. 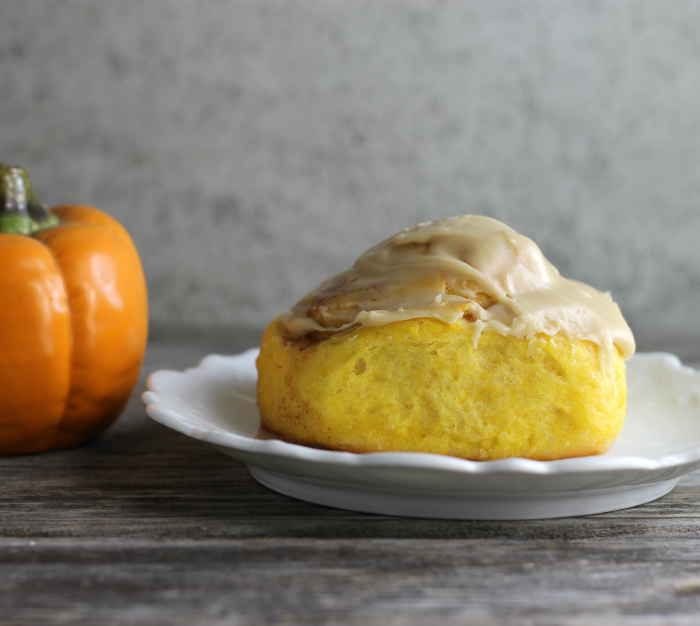 Frost the pumpkin sweet rolls and serve. A perfect fall treat! These rolls looks so delicious! Definitely a great roll to kick start the day! I love pumpkin bread/rolls…these look so light and fluffy…great filling Dawn…delicious at anytime of the day.